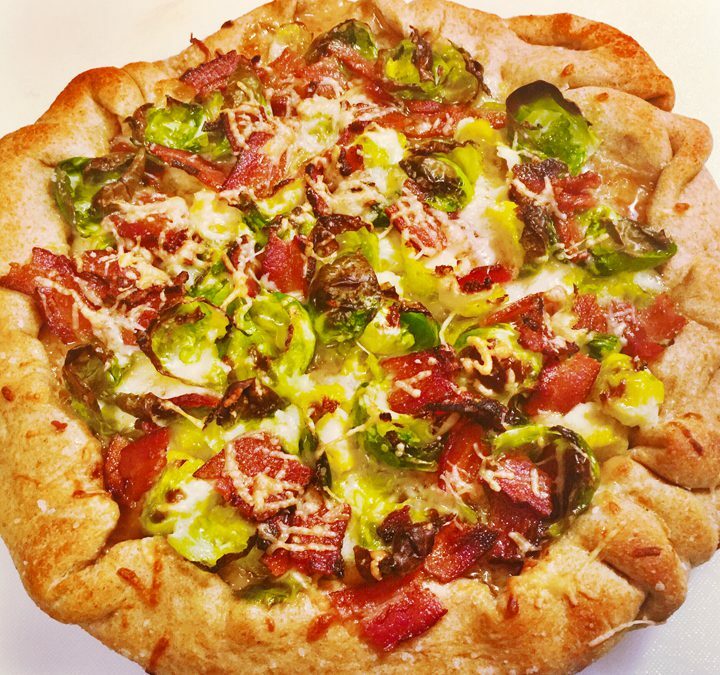 Loaded with oven roasted Brussels sprout leaves, applewood smoked bacon, and Parmesan cheese over an onion jam base – it’s the perfect fall Friday night pizza or the perfect food to warm up on the cooler nights. To prepare the bacon, preheat the oven 450˚ F. Place the bacon on a cooling rack set over a foil-lined sheet tray. Sprinkle with the sugar, then bake for 15 minutes. Remove from the oven, cool slightly, and then cut each strip into 10 pieces. Leave the oven on. While the bacon cooks, using a small paring knife, continue slicing off small pieces of the stem of a Brussels sprout to remove all the leaves from the sprout; cut the remaining small center in half. Add to a bowl until you have 3 cups. Add 1 tablespoon of olive oil and ½ teaspoon salt. Toss to combine and set aside. Set the oven temperature up to 525˚ F. Roll out the pizza dough into a 12” circle. On the stovetop, heat a 12” cast iron pan over medium-high to just hot. Remove from the heat and add 1½ tablespoon of olive oil. Using a pastry brush, spread to cover the pan bottom then sprinkle with ½ teaspoon salt. Carefully add the dough to the hot pan and press to cover the bottom and slightly up the side. Lightly brush the dough, especially the edges where the crust will form, with olive oil and sprinkle with a pinch of salt. Top with the onion jam, spreading evenly in the center leaving a 1” border. Add the mozzarella cheese, then the Brussels sprout leaves, followed by the bacon. Top the pizza with the Parmesan cheese, place in the oven, and bake for 10 -12 minutes or until the crust is golden brown. Remove from the oven and immediately remove from the cast iron pan. Rest 5 minutes before cutting into 8 servings.